Despite being barely competitive, the Jazz drew well during their first five years. However, by 1979 the franchise was sinking financially. Barry Mendelson, the team’s executive vice president for most of the early years, said one factor in the financial trouble was an 11 percent amusement tax, highest in the nation at the time. The team also couldn’t attract much local corporate support an important factor even in those days or local investors. Battisone concluded that the franchise could not be viable in New Orleans and decided to move elsewhere. After scouting several new homes, he decided to move to Salt Lake City, even though it was a smaller market. 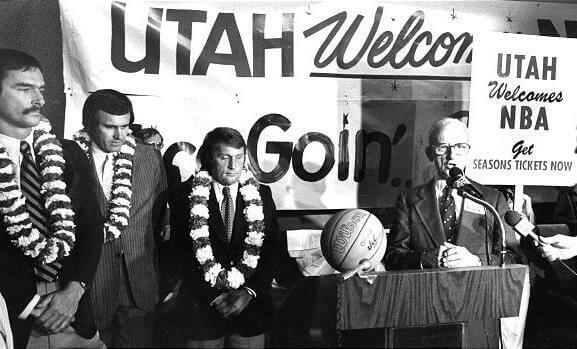 However, Salt Lake City had proven it could support a pro basketball team when it played host to the American Basketball Association’s Utah Stars from 1970 to 1976. The Stars had been extremely popular in the city and had even won an ABA title in their first season after moving from Los Angeles. However, their finances inexplicably collapsed in their last two seasons, and they were shut down by the league 16 games into the 1975 – 1976 season after missing payroll. Although Salt Lake City was not known for its jazz culture, the team decided to keep the name, as well as the team’s original colors of green, purple and gold (the colors of Mardi Gras). Some were offended by the Jazz keeping the franchise name after moving from New Orleans, citing it as a metaphor for the theft of Jazz from its cultural roots; other commentators, including David Halberstam, noted that it was highly incongruous to have a nickname based on a genre of music largely pioneered and led by African-American artists used for a team in a state where the main religious body—the LDS Church—expressed many derogatory ideas towards blacks.